TVO parents is an online resource for parents of preschool and school aged children and features a live weekly interactive parenting event. Ontario Education Resource Bank is an online library of activities and resource materials for students of all grades. Students can participate in online exercises and activities that they can do at home to reinforce learning. 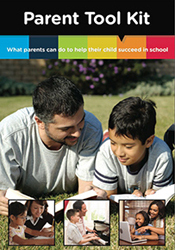 Parents can assist their children using the Ontario Education Resource Bank by using their student's account. Please ask your school for the login information, if your child has not already brought it home. Discovery Education has a large number of educational resources. A section of their website concentrates on Science Fair Tips and Tricks such as "presentation do's and don'ts; student checklist; shopping list and how to deliver an oral presentation". Parents and students can find advice from "how help their child come up with an idea for the project" to "setting a timeline". Especially good for secondary school students. This short video outlines the use of an e-portfolio and how to create one. This website explains the use of digital storytelling and how a variety of images, text, video and more can be used to create digital stories. You will find examples, definitions and explanatory videos. Windows Movie Maker, Photostory and iMovie (Mac users) can be used to create video. Voice Thread http://voicethread.com for storage and hosting of slides, images and videos with the capability of leaving a text, voice or video comment. Aviary http://aviary.com is a free suite of online creation tools. Tips on public speaking for kids. This site gives suggestions for how to practise their skills for speaking in public and overcome the fear of public speaking. In this website you will find resources and support for everyone interested in media literacy and digital literacy for young people. "Be Web Aware" covers subjects such as homework online, internet safety, social networking (Facebook), instant messaging and cell phone usage. The EatRight Ontario website is set up to help you improve your health and quality of life through healthy eating. This service provides easy-to- use nutrition information to help you make healthier food choices. You can contact a dietician directly by email or toll free phone call. Healthy schools offers tips and tools for parents to help keep your child healthy and active. School Boards across Ontario offer a variety of online learning courses for secondary students. Students can find course offerings for the school year. The delivery of online learning includes a wide range of activities such as chat, threaded discussion, blogs, whiteboards, quizzes, and student tracking. Consult with your school board for access to online learning courses and requirements. Kids Help Phone is Canada's leading youth counselling service. Available anytime of the day or night by phone and by web, it is the go-to resource for kids in Canada from years five to 20 when they need help or trustworthy information. Designed for both teens and younger children the activities cover a wide range of topics. Moderated discussion forums let students publish their thoughts on the web.